I’m not a fan of ballet or most of Daren Aronofsky movies (“Requiem For A Dream” and “The Fountain” were especially tough to watch). But he really outdid himself with “Black Swan”, turning ballet into his own dark twisted world. The star of the show: Natalie Portman, who gives the performance of her career as Nina, a dancer who has to deal with the pressure of playing the swan queen in a New York production of “The Swan Lake”. The company’s director (played by a wonderful Vincent Cassel) is impressed by Nina’s innocence as Odette, the White Swan, but feels she lacks the seductive side required to play Odette’s alter ego, The Black Swan. “Go home and touch yourself” he advises her, as Nina begins to get in touch with her dark side, with disastrous consequences. 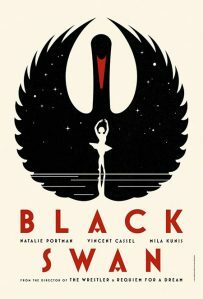 “Black Swan” is a tense, thrilling, and exhausting film, but it’s also very gripping and quite seductive actually. As long as you agree to tag along for the ride, you won’t know what hit you by the time the credits start rolling. We get to see what she sees, experience what she experiences, and as much as it can be disturbing at times, nothing can prepare you for the final scene, a masterfully crafted climax that only Aronofsky’s twisted imagination could deliver. Portman’s performance is award worthy; Oscar, I hope you’re watching. haha I bought a good copy 2day. Clear picture and sound. Couldnt wait 1 more month to watch it. Im still in for True Grit! I will watch this one in the theatre. heeeeey:@:@ where did youuu watch it!! i just saw ur answer but still that’s the 1st thing i had on my mind!la2 i refuse to read what you wrote (i have no idea if you revealed the story) so i refuse!! come on wait the less fortunate people to watch it walaw! unacceptable! lol 1: i got a good copy. 2: I didnt reveal much about the story. Just the general parts :p so u can still read it if u want. And I wrote the review so that less fortunate ppl like u can decide wether or not its a good idea to watch it :p 3: watch it and get back to me :p id like to know ur opinion abt it! yalla go watch it!!! Agree with you. Was a very tense movie! Watching the movie…you really don’t know WHAT to believe anymore. “Is this true? Is this really happening or is it all in her head”? Exactly! And I think this is why the movie requires a second viewing. But the whole movie would not be the same if it weren’t for the final scene. What a climax! Brilliant! Ballet? horrible! but guess what?? its perfect! before buying my ticket i was wondering eno why the hell am i going to watch a ballet movie?? and im glad i made the mistake and went for it!! the movie is so dark and thrilling, capturing all your attention with every dance movement (and otther movements:P) and dialogue! Natalie portman delivered an electrifying performance like no other! and Vincent kassel has an interesting role too to watch! i’ll give it a 3.5/4. And like i said: it’s the final scene that makes u admire the movie as a whole. Natalie portman was beyond terrific. Oscars in 2 weeks. She’ll definitely win it! Aaaaw i finally saw this one and i sooo loved it! It’s a 3.5 for me:p the black swan’s ballet part was enjoyable though im not a ballet fan bas the story overall and her perfection psychosis w between her mom and the director. la2 7abbet! Ana I loved the final scene the most! I just loved the way the movie ended. And yes akhiran u saw it :p uve been talking abt it for weeks! I found the movie to be a little bit of a rip-off from the 1948 “The Red Shoes”. As a ballet fan, I found that it could use some more dancing sequences. But as Lily says: “it’s not for everyone” and what’s great is that Aronofsky allows people who aren’t fans of ballet to enjoy it. Sanity (or maybe insanity in this movie) is one of my favorite themes in a film (especially when the director allows you to view everything from an insane person’s point of view– like The Shining) and that’s why I loved watching “Black Swan”. I thought Kunis was underrated though.